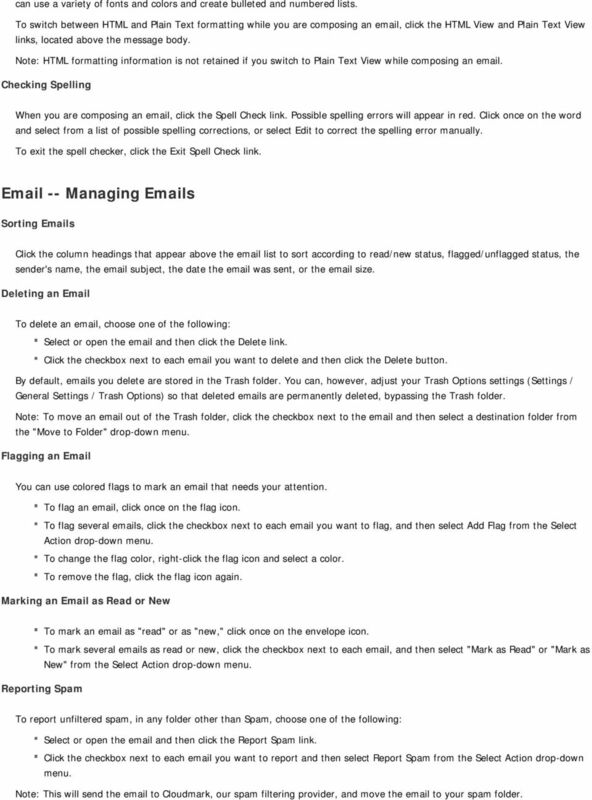 Download "Email -- Reading and Printing Email"
1 -- Reading and Printing Checking for New By default, webmail checks for new automatically. If you want to manually check for new , click the Check button. Or, click the arrow on the tab and select Check . 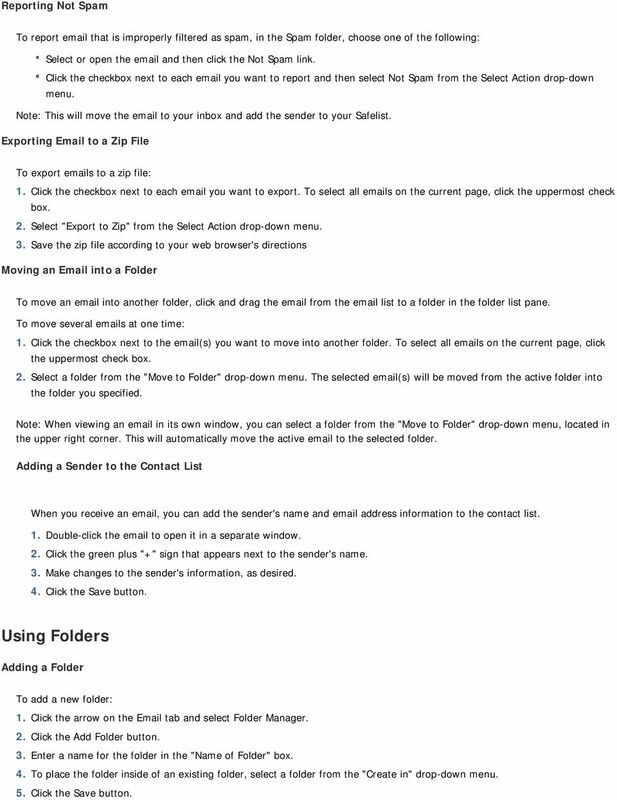 Note: To indicate how often webmail should check for new , select Settings / General Settings. Under New Messages, select an interval from the "Check for new every" drop-down menu. Previewing or Opening an You can use the preview pane to display a selected without opening it in a separate window. To preview an , click once on the , as it appears in the list. Or, to open an in a separate window, double-click the . Note: To display or hide the preview pane, select Settings / General Settings. Under Display Preferences, check or clear the "Display the preview pane" checkbox. Opening or Saving an Attachment When someone sends you an that contains an attachment, the attachment name will appear in the Attachments area, above the message body. To open an attachment: 1. Click once on the attachment name. 2. Open the attachment according to your web browser's directions. 3. 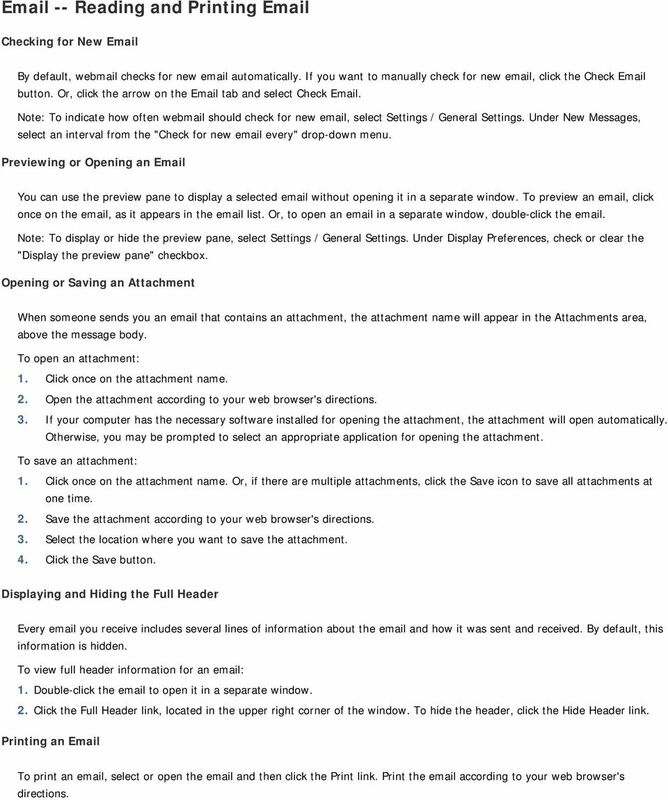 If your computer has the necessary software installed for opening the attachment, the attachment will open automatically. Otherwise, you may be prompted to select an appropriate application for opening the attachment. To save an attachment: 1. Click once on the attachment name. Or, if there are multiple attachments, click the Save icon to save all attachments at one time. 2. Save the attachment according to your web browser's directions. 3. Select the location where you want to save the attachment. 4. Click the Save button. Displaying and Hiding the Full Header Every you receive includes several lines of information about the and how it was sent and received. By default, this information is hidden. To view full header information for an 1. Double-click the to open it in a separate window. 2. Click the Full Header link, located in the upper right corner of the window. To hide the header, click the Hide Header link. 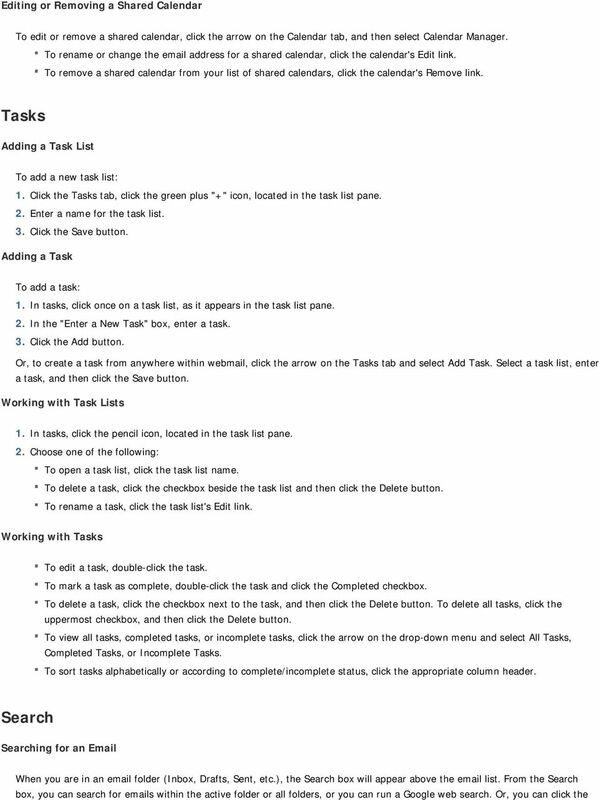 Printing an To print an , select or open the and then click the Print link. Print the according to your web browser's directions. 2 -- Composing Composing a New To compose a new 1. Click the Compose button. Or, click the arrow on the tab and select Compose Select an identity from the From drop-down menu, if available. (The From drop-down menu will only appear if you have more than one identity.) 3. Enter recipient addresses in the To box, separating multiple addresses with a comma or semicolon. 4. To send a carbon copy (Cc) or blind carbon copy (Bcc), enter recipient addresses in the Cc or Bcc boxes. 5. Enter a description of the in the Subject box. 6. Enter the text of your in the message body. 7. Click the Send button. Replying to an To reply to an 1. Select or open the to which you want to reply. 2. To reply to the sender only, click the Reply link. Or, to reply to all recipients, click the Reply All link. 3. Enter your reply message in the message body. 4. Click the Send button. Forwarding an To forward an 1. Select or open the you want to forward. 2. Click the Forward link. 3. Enter recipient addresses in the To box, separating multiple addresses with a comma or semicolon. 4. To send a carbon copy (Cc) or blind carbon copy (Bcc), enter recipient addresses in the Cc or Bcc boxes. 5. Enter any accompanying text in the message body. 6. Click the Send button. Addressing an Webmail includes several tools to help you address your . --Address Auto-Complete-- As you type a name or address in the To, Cc, or Bcc box, webmail will attempt to complete the address with a matching address from your contact list. Use your arrow keys to select a suggested match, and then press the Tab (or Enter/Return) key on your keyboard. --Address Book-- You can select contacts from your contact list by clicking the To, Cc, or Bcc links. --Frequent Contacts-- You can have quick access to your frequently used contacts by adding them to the Frequent Contacts box. To add a contact to the Frequent Contacts box: 1. Click the Contacts tab. 2. Select a contact, and click the Edit Contact link in the Details section. Or, click the Add Contact button to create a new contact. 3. Click the "Add to the Frequent Contacts" checkbox. 4 can use a variety of fonts and colors and create bulleted and numbered lists. To switch between HTML and Plain Text formatting while you are composing an , click the HTML View and Plain Text View links, located above the message body. Note: HTML formatting information is not retained if you switch to Plain Text View while composing an . Checking Spelling When you are composing an , click the Spell Check link. Possible spelling errors will appear in red. Click once on the word and select from a list of possible spelling corrections, or select Edit to correct the spelling error manually. To exit the spell checker, click the Exit Spell Check link. -- Managing s Sorting s Click the column headings that appear above the list to sort according to read/new status, flagged/unflagged status, the sender's name, the subject, the date the was sent, or the size. Deleting an To delete an , choose one of the following: Select or open the and then click the Delete link. Click the checkbox next to each you want to delete and then click the Delete button. By default, s you delete are stored in the Trash folder. You can, however, adjust your Trash Options settings (Settings / General Settings / Trash Options) so that deleted s are permanently deleted, bypassing the Trash folder. Note: To move an out of the Trash folder, click the checkbox next to the and then select a destination folder from the "Move to Folder" drop-down menu. Flagging an You can use colored flags to mark an that needs your attention. To flag an , click once on the flag icon. To flag several s, click the checkbox next to each you want to flag, and then select Add Flag from the Select Action drop-down menu. To change the flag color, right-click the flag icon and select a color. To remove the flag, click the flag icon again. Marking an as Read or New To mark an as "read" or as "new," click once on the envelope icon. To mark several s as read or new, click the checkbox next to each , and then select "Mark as Read" or "Mark as New" from the Select Action drop-down menu. Reporting Spam To report unfiltered spam, in any folder other than Spam, choose one of the following: Select or open the and then click the Report Spam link. Click the checkbox next to each you want to report and then select Report Spam from the Select Action drop-down menu. Note: This will send the to Cloudmark, our spam filtering provider, and move the to your spam folder. 5 Reporting Not Spam To report that is improperly filtered as spam, in the Spam folder, choose one of the following: Select or open the and then click the Not Spam link. Click the checkbox next to each you want to report and then select Not Spam from the Select Action drop-down menu. Note: This will move the to your inbox and add the sender to your Safelist. Exporting to a Zip File To export s to a zip file: 1. Click the checkbox next to each you want to export. To select all s on the current page, click the uppermost check box. 2. Select "Export to Zip" from the Select Action drop-down menu. 3. Save the zip file according to your web browser's directions Moving an into a Folder To move an into another folder, click and drag the from the list to a folder in the folder list pane. To move several s at one time: 1. Click the checkbox next to the (s) you want to move into another folder. To select all s on the current page, click the uppermost check box. 2. Select a folder from the "Move to Folder" drop-down menu. The selected (s) will be moved from the active folder into the folder you specified. Note: When viewing an in its own window, you can select a folder from the "Move to Folder" drop-down menu, located in the upper right corner. This will automatically move the active to the selected folder. Adding a Sender to the Contact List When you receive an , you can add the sender's name and address information to the contact list. 1. Double-click the to open it in a separate window. 2. Click the green plus "+" sign that appears next to the sender's name. 3. Make changes to the sender's information, as desired. 4. Click the Save button. Using Folders Adding a Folder To add a new folder: 1. Click the arrow on the tab and select Folder Manager. 2. Click the Add Folder button. 3. Enter a name for the folder in the "Name of Folder" box. 4. To place the folder inside of an existing folder, select a folder from the "Create in" drop-down menu. 5. Click the Save button. 6 Moving a Folder To move a folder: 1. Click the arrow on the tab and select Folder Manager. 2. Click the checkbox next to the folder(s) you want to move into another folder. 3. Select a folder from the "Move to Folder" drop-down menu. Renaming a Folder To rename a folder: 1. Click the arrow on the tab and select Folder Manager. 2. Click the Edit link for the folder you want to rename. 3. Enter a new name in the "Name of Folder" box. 4. Click the Save button. Moving an into a Folder To move an into another folder, click and drag the from the list to a folder in the folder list pane. To move several s at one time: 1. Click the checkbox next to the (s) you want to move into another folder. To select all s on the current page, click the uppermost check box. 2. Select a folder from the "Move to Folder" drop-down menu. The selected (s) will be moved from the active folder into the folder you specified. Note: When viewing an in its own window, you can select a folder from the "Move to Folder" drop-down menu, located in the upper right corner. This will automatically move the active to the selected folder. Viewing Folder Size To view the storage size of all folders: 1. 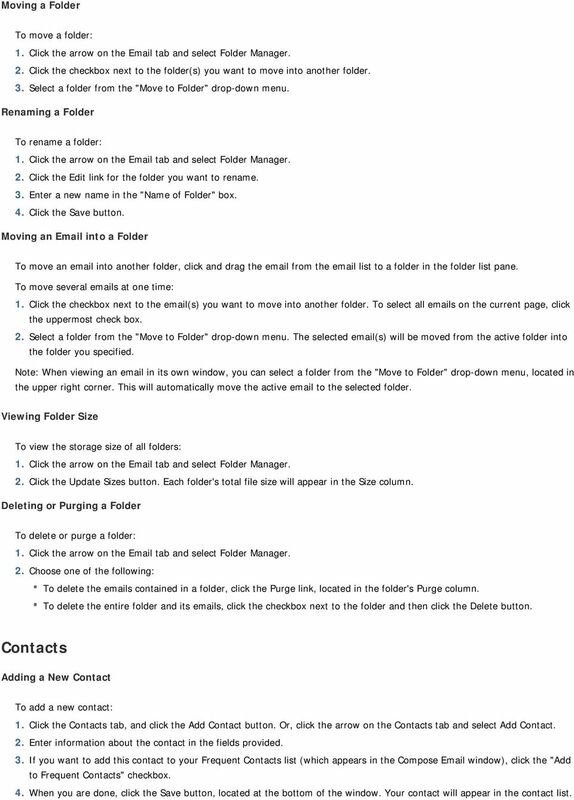 Click the arrow on the tab and select Folder Manager. 2. Click the Update Sizes button. Each folder's total file size will appear in the Size column. Deleting or Purging a Folder To delete or purge a folder: 1. Click the arrow on the tab and select Folder Manager. 2. Choose one of the following: To delete the s contained in a folder, click the Purge link, located in the folder's Purge column. To delete the entire folder and its s, click the checkbox next to the folder and then click the Delete button. Contacts Adding a New Contact To add a new contact: 1. Click the Contacts tab, and click the Add Contact button. Or, click the arrow on the Contacts tab and select Add Contact. 2. Enter information about the contact in the fields provided. 3. If you want to add this contact to your Frequent Contacts list (which appears in the Compose window), click the "Add to Frequent Contacts" checkbox. 4. When you are done, click the Save button, located at the bottom of the window. Your contact will appear in the contact list. 7 Adding a New Group To add a new contact group: 1. Click the Contacts tab, and click the Add Group button. Or, click the arrow on the Contacts tab and select Add Group. 2. Enter a name for the group in the New Group Name box. 3. In the Contacts box, click once on the contact you want to add to your group. Or, to select several contacts at one time, choose one of the following: To select several names, hold the Ctrl key as you click on each name. To select a range of names, click on the first contact in the range, hold the Shift key, and then click the last contact in the range. 4. Click the right arrow button to add the selected contact(s) to the group. 5. If you want to remove a name from the New Group box, click the name and then click the Remove button. 6. When you are done, click the Save button. Your group will appear in your groups list. 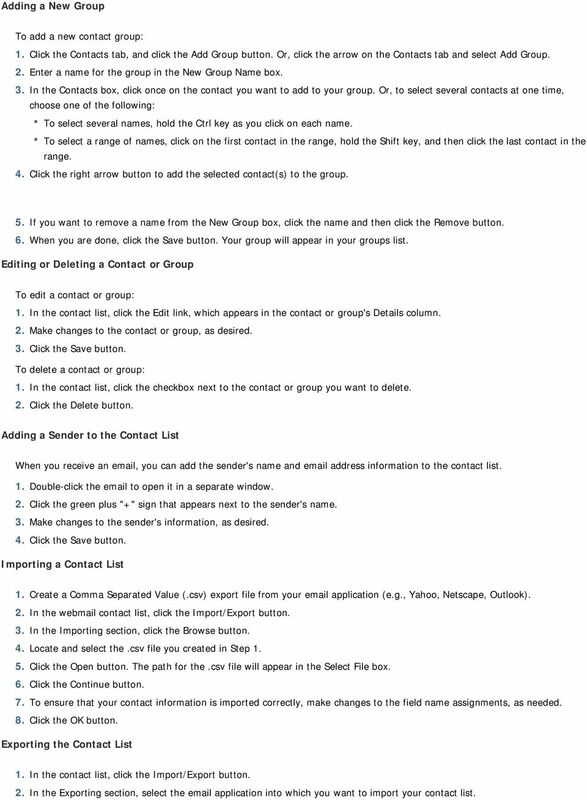 Editing or Deleting a Contact or Group To edit a contact or group: 1. In the contact list, click the Edit link, which appears in the contact or group's Details column. 2. Make changes to the contact or group, as desired. 3. Click the Save button. To delete a contact or group: 1. In the contact list, click the checkbox next to the contact or group you want to delete. 2. Click the Delete button. Adding a Sender to the Contact List When you receive an , you can add the sender's name and address information to the contact list. 1. Double-click the to open it in a separate window. 2. Click the green plus "+" sign that appears next to the sender's name. 3. Make changes to the sender's information, as desired. 4. Click the Save button. Importing a Contact List 1. Create a Comma Separated Value (.csv) export file from your application (e.g., Yahoo, Netscape, Outlook). 2. In the webmail contact list, click the Import/Export button. 3. In the Importing section, click the Browse button. 4. Locate and select the.csv file you created in Step Click the Open button. The path for the.csv file will appear in the Select File box. 6. Click the Continue button. 7. To ensure that your contact information is imported correctly, make changes to the field name assignments, as needed. 8. Click the OK button. Exporting the Contact List 1. In the contact list, click the Import/Export button. 2. In the Exporting section, select the application into which you want to import your contact list. 8 3. Click the Export button. Depending on your web browser settings, you may need to choose one of the following: If your browser prompts you to save or open the.csv file, click the Save button. If a new browser window appears, displaying the contact list information, select File / Save As to save the file. 4. Select the location where you want to save the.csv export file. 5. Click the Save button. Using the Company Directory If your administrator has created a company directory, you can view up-to-date contact information about other users in your company and/or partner companies. The company directory is located in the contacts list, below the Groups section. To keep your own contact information up-to-date, locate your name in the company directory list, click the Edit link, and then make changes, as desired. Note: Depending on your administrator's settings, the Edit link may not be visible. Calendar Adding an Event To add an event to your calendar: 1. Click the calendar tab, and click the Add Event button. Or, double-click the time/day on which you want to add an event. 2. Enter a subject and date/time information, as desired. 3. Click the Save button. Setting Recurrence Details To add recurrence to a calendar event: 1. In the calendar, double-click the event you want to edit. 2. Click the Set Recurrence link. 3. Click the Daily, Weekly, Monthly, or Yearly tab to create a daily, weekly, monthly, or yearly recurrence. 4. In the resulting tab, indicate how often the event should occur. 5. In the Range section, indicate when the recurrence should end. 6. When you are done, click the Set Recurrence button. 7. Click the Save button. Creating a Private Event If your account is set up to use shared calendaring, you may want to hide events that you want to keep private. Other users will see that the time is reserved, but all event information will be hidden. 1. In the calendar, double-click the event you want to edit. 2. Click the Private Event checkbox to make the event private. 3. Click the Save button. 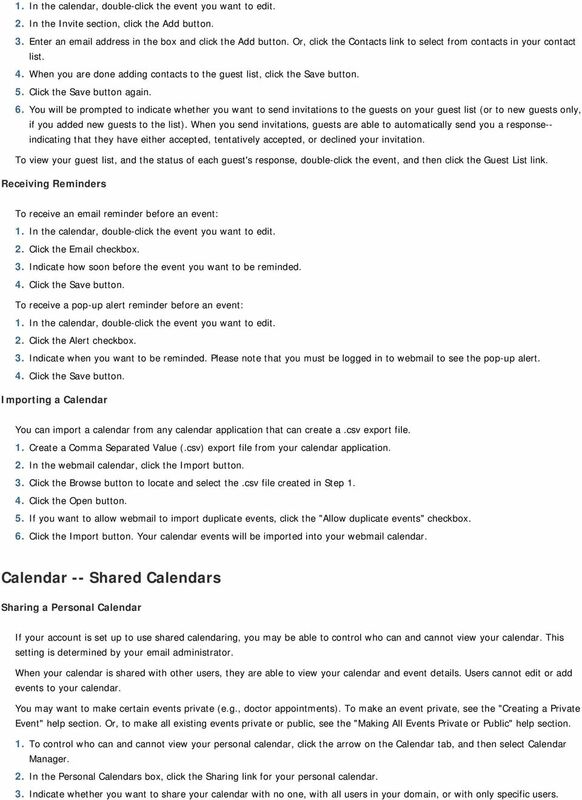 Note: For more information about shared calendars, see the Shared Calendars help section. Inviting Guests to an Event You can use webmail to invite guests to an event, manage guest responses, and send notifications of any changes. This feature is compatible with all ical compliant calendar applications. 9 1. In the calendar, double-click the event you want to edit. 2. In the Invite section, click the Add button. 3. Enter an address in the box and click the Add button. Or, click the Contacts link to select from contacts in your contact list. 4. When you are done adding contacts to the guest list, click the Save button. 5. Click the Save button again. 6. You will be prompted to indicate whether you want to send invitations to the guests on your guest list (or to new guests only, if you added new guests to the list). When you send invitations, guests are able to automatically send you a response-- indicating that they have either accepted, tentatively accepted, or declined your invitation. To view your guest list, and the status of each guest's response, double-click the event, and then click the Guest List link. Receiving Reminders To receive an reminder before an event: 1. In the calendar, double-click the event you want to edit. 2. Click the checkbox. 3. Indicate how soon before the event you want to be reminded. 4. Click the Save button. To receive a pop-up alert reminder before an event: 1. In the calendar, double-click the event you want to edit. 2. Click the Alert checkbox. 3. Indicate when you want to be reminded. Please note that you must be logged in to webmail to see the pop-up alert. 4. Click the Save button. Importing a Calendar You can import a calendar from any calendar application that can create a.csv export file. 1. Create a Comma Separated Value (.csv) export file from your calendar application. 2. In the webmail calendar, click the Import button. 3. Click the Browse button to locate and select the.csv file created in Step Click the Open button. 5. If you want to allow webmail to import duplicate events, click the "Allow duplicate events" checkbox. 6. Click the Import button. Your calendar events will be imported into your webmail calendar. Calendar -- Shared Calendars Sharing a Personal Calendar If your account is set up to use shared calendaring, you may be able to control who can and cannot view your calendar. This setting is determined by your administrator. When your calendar is shared with other users, they are able to view your calendar and event details. Users cannot edit or add events to your calendar. You may want to make certain events private (e.g., doctor appointments). 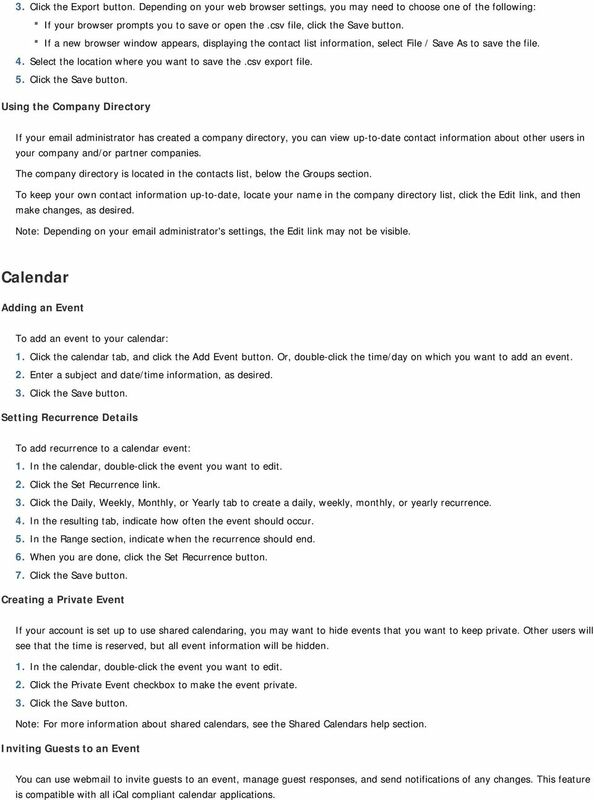 To make an event private, see the "Creating a Private Event" help section. Or, to make all existing events private or public, see the "Making All Events Private or Public" help section. 1. To control who can and cannot view your personal calendar, click the arrow on the Calendar tab, and then select Calendar Manager. 2. In the Personal Calendars box, click the Sharing link for your personal calendar. 3. Indicate whether you want to share your calendar with no one, with all users in your domain, or with only specific users. 10 4. If you want to share your calendar only with specific users, select from the list of users in your domain. Or, enter an address manually and click the Add button. 5. Click the Save button. Creating a Private Event If your account is set up to use shared calendaring, you may want to hide events that you want to keep private. Other users will see that the time is reserved, but all event information will be hidden. 1. In the calendar, double-click the event you want to edit. 2. Click the Private Event checkbox to make the event private. 3. Click the Save button. 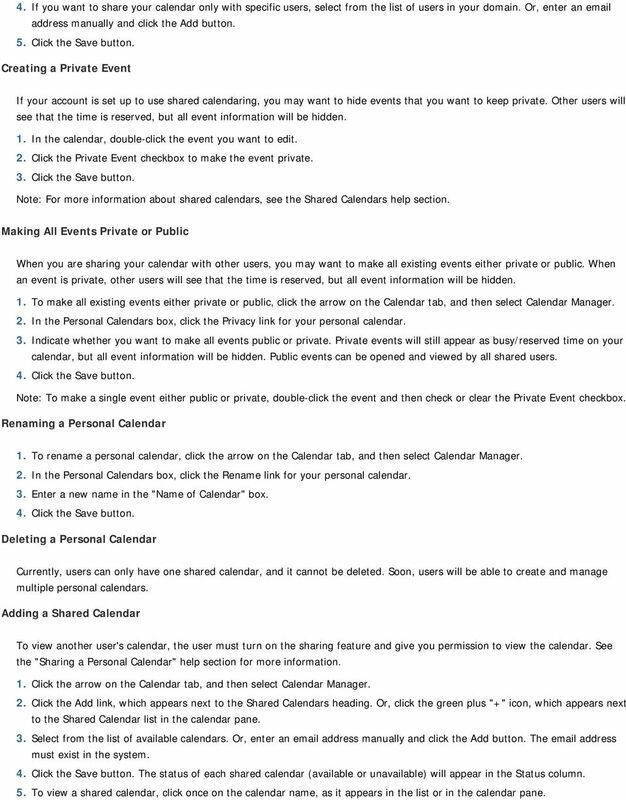 Note: For more information about shared calendars, see the Shared Calendars help section. Making All Events Private or Public When you are sharing your calendar with other users, you may want to make all existing events either private or public. When an event is private, other users will see that the time is reserved, but all event information will be hidden. 1. To make all existing events either private or public, click the arrow on the Calendar tab, and then select Calendar Manager. 2. In the Personal Calendars box, click the Privacy link for your personal calendar. 3. Indicate whether you want to make all events public or private. Private events will still appear as busy/reserved time on your calendar, but all event information will be hidden. Public events can be opened and viewed by all shared users. 4. Click the Save button. Note: To make a single event either public or private, double-click the event and then check or clear the Private Event checkbox. Renaming a Personal Calendar 1. To rename a personal calendar, click the arrow on the Calendar tab, and then select Calendar Manager. 2. In the Personal Calendars box, click the Rename link for your personal calendar. 3. Enter a new name in the "Name of Calendar" box. 4. Click the Save button. Deleting a Personal Calendar Currently, users can only have one shared calendar, and it cannot be deleted. Soon, users will be able to create and manage multiple personal calendars. Adding a Shared Calendar To view another user's calendar, the user must turn on the sharing feature and give you permission to view the calendar. See the "Sharing a Personal Calendar" help section for more information. 1. Click the arrow on the Calendar tab, and then select Calendar Manager. 2. Click the Add link, which appears next to the Shared Calendars heading. Or, click the green plus "+" icon, which appears next to the Shared Calendar list in the calendar pane. 3. Select from the list of available calendars. Or, enter an address manually and click the Add button. The address must exist in the system. 4. Click the Save button. The status of each shared calendar (available or unavailable) will appear in the Status column. 5. To view a shared calendar, click once on the calendar name, as it appears in the list or in the calendar pane. 12 Advanced link to run a detailed search. To search for an using the Search box: 1. Click the folder icon on the Search box and indicate whether you want to search the active folder or all folders. 2. Enter the word(s) you want to search for in the Search box. 3. Click the Search button. 4. A list of s that contain the search criteria will appear in the list. You can then refine the search by selecting a different folder, viewing only the s that contain attachments, or changing the search terms altogether. 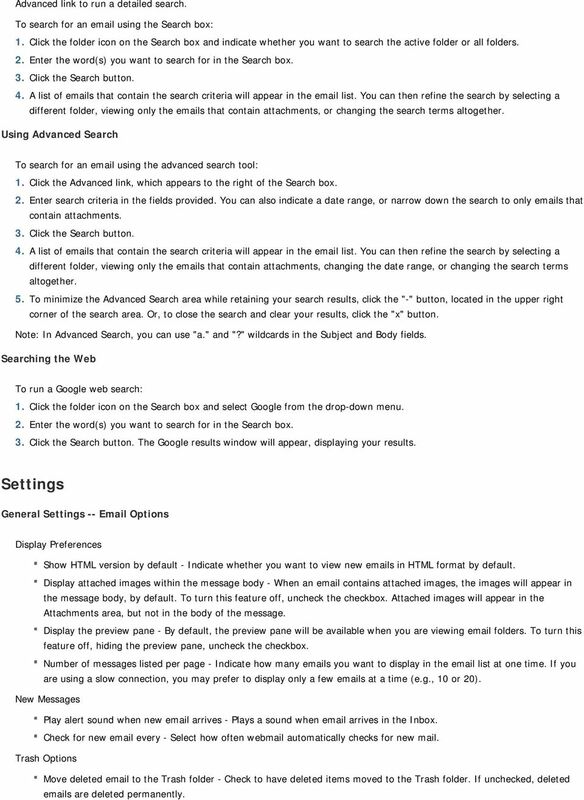 Using Advanced Search To search for an using the advanced search tool: 1. Click the Advanced link, which appears to the right of the Search box. 2. Enter search criteria in the fields provided. You can also indicate a date range, or narrow down the search to only s that contain attachments. 3. Click the Search button. 4. A list of s that contain the search criteria will appear in the list. You can then refine the search by selecting a different folder, viewing only the s that contain attachments, changing the date range, or changing the search terms altogether. 5. To minimize the Advanced Search area while retaining your search results, click the "-" button, located in the upper right corner of the search area. Or, to close the search and clear your results, click the "x" button. Note: In Advanced Search, you can use "a." and "?" wildcards in the Subject and Body fields. Searching the Web To run a Google web search: 1. Click the folder icon on the Search box and select Google from the drop-down menu. 2. Enter the word(s) you want to search for in the Search box. 3. Click the Search button. The Google results window will appear, displaying your results. Settings General Settings -- Options Display Preferences Show HTML version by default - Indicate whether you want to view new s in HTML format by default. Display attached images within the message body - When an contains attached images, the images will appear in the message body, by default. To turn this feature off, uncheck the checkbox. Attached images will appear in the Attachments area, but not in the body of the message. Display the preview pane - By default, the preview pane will be available when you are viewing folders. To turn this feature off, hiding the preview pane, uncheck the checkbox. Number of messages listed per page - Indicate how many s you want to display in the list at one time. If you are using a slow connection, you may prefer to display only a few s at a time (e.g., 10 or 20). New Messages Play alert sound when new arrives - Plays a sound when arrives in the Inbox. Check for new every - Select how often webmail automatically checks for new mail. Trash Options Move deleted to the Trash folder - Check to have deleted items moved to the Trash folder. If unchecked, deleted s are deleted permanently. 13 Move purged to the Trash folder - Check to have purged items moved to the Trash folder. If unchecked, purged s are deleted permanently. General Settings -- Language and Date/Time Language Default display language - Select from eight possible display languages. Date and Time Default date format - Select a month/day/year or day/month/year date format. Default time format - Select a 12 or 24 hour time display for messages. Current time zone - Select a time zone. Composing -- Composing Composing Use auto-complete when addressing - Check to have webmail attempt to complete typed addresses with a matching address from your contact list. Display the Frequent Contacts box - Check to display the Frequent Contacts box, which appears in the Compose window. Disable browser's built-in spell checker - Check to disable the browser's automatic spell checking. 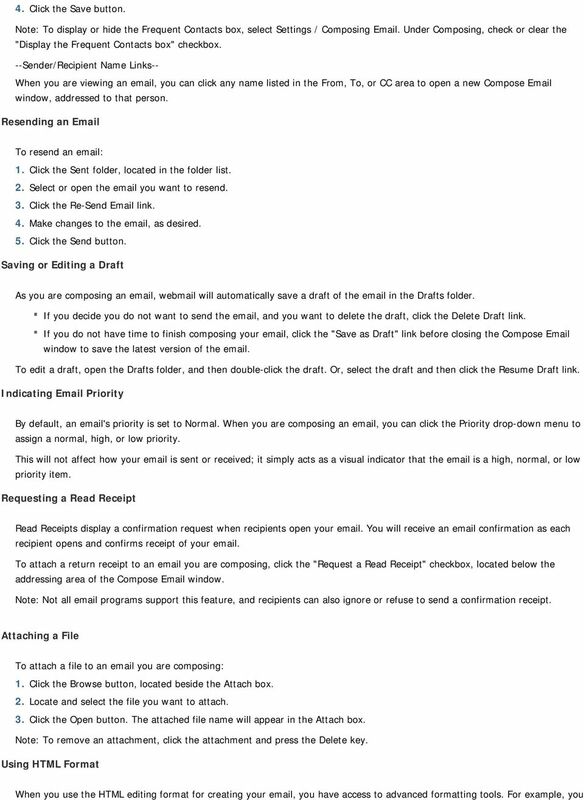 Save outgoing in the Sent folder - Check to copy all outgoing to the Sent folder. Default font in HTML format - Select a default font for HTML-formatted . Default font size in HTML format - Select a default font size for HTML-formatted . Replying and Forwarding Citations Customize or remove the label used when forwarding or replying to . Examples are provided. Composing -- Identities Use the Identities feature to make changes to your display name, address, and reply address. To add a new identity: 1. Click the Add New Identity button. 2. Enter your display name and address in the spaces provided, as needed. 3. In the Reply To box, enter the address you want recipients to use when they reply to an you have sent. 4. Click the OK button. To edit an identity, select an identity, and click the Edit button. To delete an identity, select an identity, and click the Delete button. To set an identity as the default, select an identity, and click the Set as Default button. Composing -- Signatures Use the Signatures feature to make changes to your signatures. To add a new signature, click the Add New Signature button, and enter a signature name and a signature in the spaces provided. Images can be uploaded for use in the signature using the Insert/Edit Image button in the HTML composer menu bar. Use the Plain Text View and HTML View links to switch between the two. Note: Signatures can be HTML or Plain Text, but not both. To edit a signature, select a signature, and click the Edit button. 14 To delete a signature, select a signature, and click the Delete button. 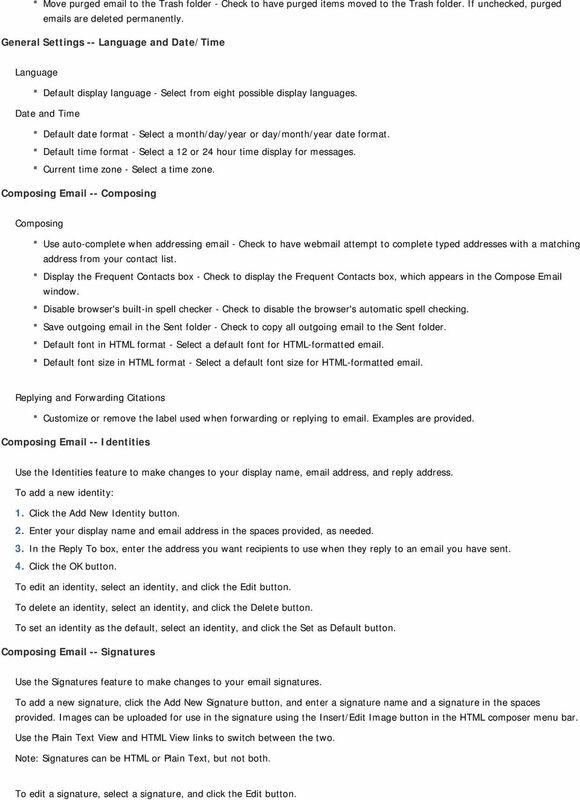 To set a signature as the default, select a signature, and click the Set as Default button. Choose options for when signatures are automatically inserted in s, as needed. Incoming -- Auto-Reply Use the auto-reply feature to set up messages that are automatically sent to any person who sends you an . Status - Turn auto-reply on or off. Auto-Reply Message - Enter your outgoing message. Enable only during the following time frame - Check to have auto-reply only function during a specific time period. Start on - Select start date and time. End on - Select end date and time. Incoming -- Forwarding Use the forwarding feature to send incoming to another account. Status - Turn forwarding on or off. Save a copy of forwarded - Check to receive a copy of all forwarded s. Forward to - Enter the address for forwarded mail. Enable only during the following time frame - Check to have forwarding only function during a specific time period. Start on - Select start date and time. End on - Select end date and time. 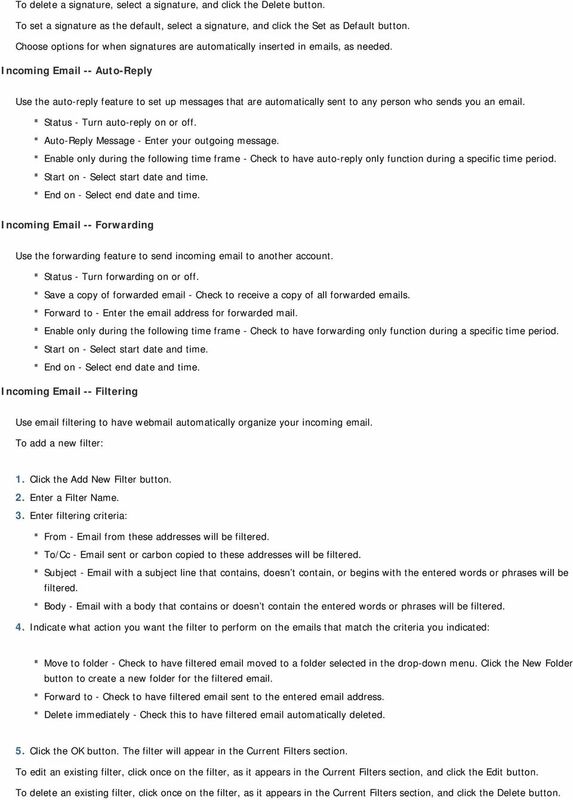 Incoming -- Filtering Use filtering to have webmail automatically organize your incoming . To add a new filter: 1. Click the Add New Filter button. 2. Enter a Filter Name. 3. Enter filtering criteria: From - from these addresses will be filtered. To/Cc - sent or carbon copied to these addresses will be filtered. Subject - with a subject line that contains, doesn t contain, or begins with the entered words or phrases will be filtered. Body - with a body that contains or doesn t contain the entered words or phrases will be filtered. 4. Indicate what action you want the filter to perform on the s that match the criteria you indicated: Move to folder - Check to have filtered moved to a folder selected in the drop-down menu. Click the New Folder button to create a new folder for the filtered . Forward to - Check to have filtered sent to the entered address. Delete immediately - Check this to have filtered automatically deleted. 5. Click the OK button. The filter will appear in the Current Filters section. To edit an existing filter, click once on the filter, as it appears in the Current Filters section, and click the Edit button. To delete an existing filter, click once on the filter, as it appears in the Current Filters section, and click the Delete button. 15 Note: If you are using software (Outlook, Netscape Mail, Eudora, etc.) with a POP3 connection, your software only downloads s that are stored in your Inbox folder. If you use filters to move s into another folder, those s will not be downloaded by your POP3 software. Spam Settings -- Preferences Spam filtering tools work to detect and filter out spam. The changes you make to your spam filtering preferences will be in effect regardless of your software; even if you use Outlook, Netscape Mail, Eudora, etc., your spam will be filtered, according to your preferences, before the reaches your inbox. 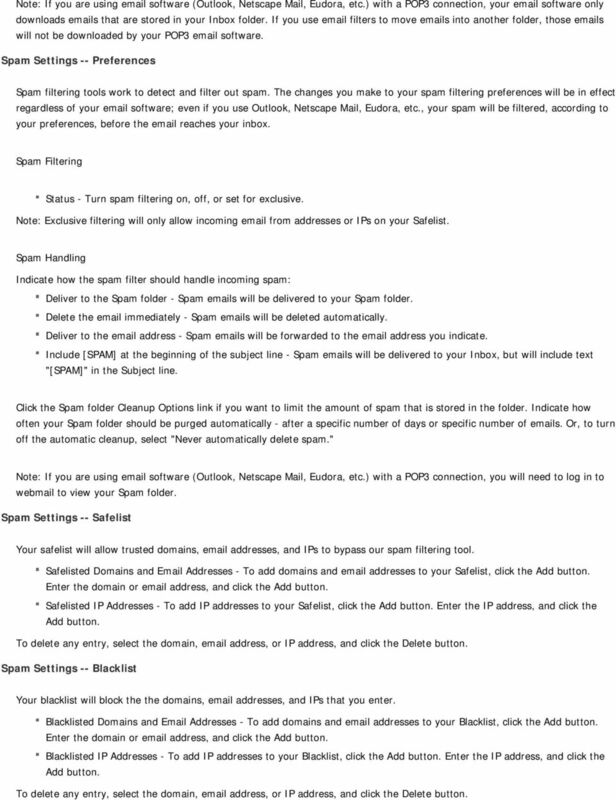 Spam Filtering Status - Turn spam filtering on, off, or set for exclusive. Note: Exclusive filtering will only allow incoming from addresses or IPs on your Safelist. Spam Handling Indicate how the spam filter should handle incoming spam: Deliver to the Spam folder - Spam s will be delivered to your Spam folder. Delete the immediately - Spam s will be deleted automatically. Deliver to the address - Spam s will be forwarded to the address you indicate. Include [SPAM] at the beginning of the subject line - Spam s will be delivered to your Inbox, but will include text "[SPAM]" in the Subject line. Click the Spam folder Cleanup Options link if you want to limit the amount of spam that is stored in the folder. Indicate how often your Spam folder should be purged automatically - after a specific number of days or specific number of s. Or, to turn off the automatic cleanup, select "Never automatically delete spam." Note: If you are using software (Outlook, Netscape Mail, Eudora, etc.) 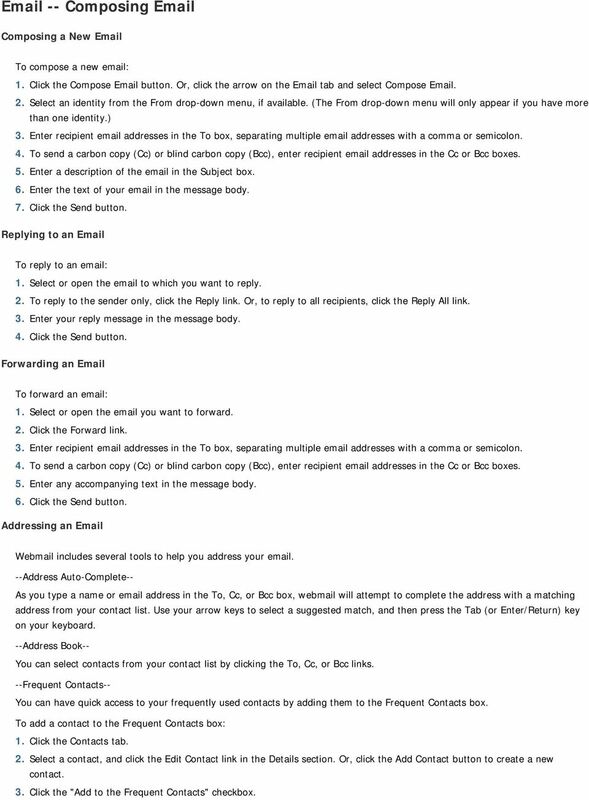 with a POP3 connection, you will need to log in to webmail to view your Spam folder. Spam Settings -- Safelist Your safelist will allow trusted domains, addresses, and IPs to bypass our spam filtering tool. Safelisted Domains and Addresses - To add domains and addresses to your Safelist, click the Add button. Enter the domain or address, and click the Add button. Safelisted IP Addresses - To add IP addresses to your Safelist, click the Add button. Enter the IP address, and click the Add button. To delete any entry, select the domain, address, or IP address, and click the Delete button. Spam Settings -- Blacklist Your blacklist will block the the domains, addresses, and IPs that you enter. Blacklisted Domains and Addresses - To add domains and addresses to your Blacklist, click the Add button. Enter the domain or address, and click the Add button. Blacklisted IP Addresses - To add IP addresses to your Blacklist, click the Add button. Enter the IP address, and click the Add button. To delete any entry, select the domain, address, or IP address, and click the Delete button. 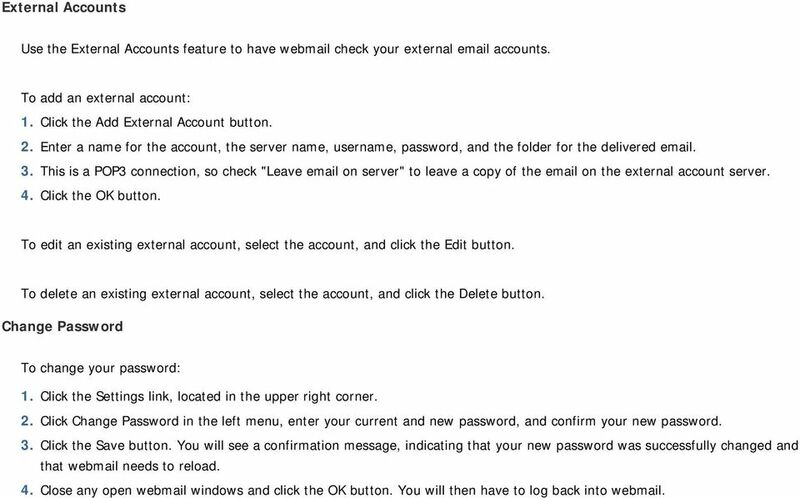 16 External Accounts Use the External Accounts feature to have webmail check your external accounts. To add an external account: 1. Click the Add External Account button. 2. Enter a name for the account, the server name, username, password, and the folder for the delivered This is a POP3 connection, so check "Leave on server" to leave a copy of the on the external account server. 4. Click the OK button. To edit an existing external account, select the account, and click the Edit button. To delete an existing external account, select the account, and click the Delete button. Change Password To change your password: 1. Click the Settings link, located in the upper right corner. 2. Click Change Password in the left menu, enter your current and new password, and confirm your new password. 3. Click the Save button. You will see a confirmation message, indicating that your new password was successfully changed and that webmail needs to reload. 4. Close any open webmail windows and click the OK button. You will then have to log back into webmail. How do I start a new email message? For detailed information on these options and more, please read the appropriately titled topic in this help document.